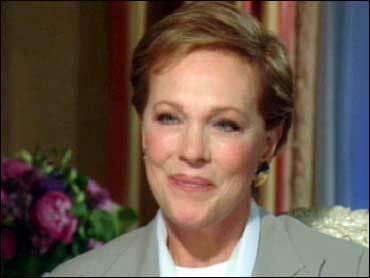 Her four-octave voice silenced by a throat operation in 1997, Julie Andrews is once again singing in the movies. Musical scenes she shot recently for "The Princess Diaries 2: Royal Engagement" may not feature the soaring tones of "The Sound of Music," but Andrews' singing still brought tears to the eyes of even hardened stage hands. The film is a sequel to the 2001 hit about an American schoolgirl (Anne Hathaway) who inherits the throne of a small European country and is trained for the role by her regal grandmother (Andrews). Set for an Aug. 11 release, the film contains a scene in which the girl, now 21 and facing marriage, recalls a song she heard in early childhood, "Your Crowning Glory," and she cajoles her grandmother into singing it. Later in the movie, Andrews' character sings the number again, this time to the granddaughter's friends. Disney is keeping the song under wraps, but those who have heard it say the rendition is reminiscent of the old Julie Andrews. "She's everything you want Julie Andrews to be; she's such a professional," said the film's music supervisor, Dawn Soler, who was there when the actress prerecorded the song, as well as when she sang it to playback during filming at Universal Studios. "She nailed the song on the first take. I looked around and I saw grips with tears in their eyes," Soler told The Associated Press. Andrews has done some limited singing on TV specials in recent years. But her manager, Steve Sauer, says "those songs were done in the Rex Harrison style: half-talking, half-singing." In "Princess Diaries 2," Andrews begins "Your Crowning Glory" with some talking, but then transitions into full song, although with a far more limited vocal range than she was once capable of before the surgery. Grossman, who had previously written songs and special material for Andrews, was the star's personal choice to compose her music for "Princess Diaries 2." "It's written in just one octave, so it wouldn't be vocally demanding," he told the AP. "I've worked with Julie, and I knew what she was capable of. This does not reflect that; it's more of a tranquil song. She told me it works beautifully," Grossman said. Andrews, 68, first achieved notice as a child in England with what she called "my freak four-octave voice." She went on to Hollywood stardom in such hit musicals as l964's "Mary Poppins," which earned her an Oscar, and "The Sound of Music," for which she received an Academy Award nomination a year later. Andrews was singing in the Broadway version of her "Victor/Victoria" film role in the mid-'90s when she began having voice trouble. She was forced to quit the musical after two years and underwent surgery to remove non-cancerous nodules. The operation left her without her singing voice and she sued two doctors and Mount Sinai hospital in New York, claiming she'd been assured the operation would eliminate her vocal problems and that she hadn't been warned of the surgery's risk. The lawsuit was settled out of court in 2000, with no terms disclosed.